The perinatal period is one of rapid physiological change, and the distinction between physiological variation and pathological change can become blurred; the extent of prematurity adds further variability. 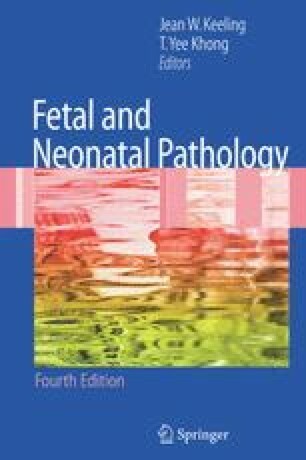 Correct interpretation of hematologi-cal abnormalities is dependent on both maternal and fetal history: the health of the mother, complications during pregnancy, placental function, the circumstances of birth, and the gestational and the conceptional age (gestational age and postnatal age) of the infant. For inherited hema-tological disorders, family history and investigation can also be informative. Most hematological abnormalities in the neonate have their origin in fetal life, and can arise from the fetus alone, be secondary to maternal pathology, or result from an interaction between the mother and fetus. Maternal pathology often exerts its effects on the fetus via the placenta—the anatomical and physiological link between the fetus and the mother, allowing interaction between the two. The placenta provides the interface between the maternal and fetal circulation, and its integrity and function are of paramount importance to the health of the fetus (Cross 2006). The placenta delivers nutrition and oxygen to the fetus, but acts as a barrier to some classes of antibody and toxins. Immunoglobulin G (IgG) is able to cross the placental barrier, enabling maternal IgG to enter the fetal circulation, giving the fetus some passive immunity against pathogens in the first few months of life. In the same way, harmful IgG antibodies such as anti-D, antiplatelet antibodies, and antiphospho-lipid antibodies can cross the placenta, causing hematological problems in the fetus. Pathogens, drugs, and toxins may also cross, resulting in intrauterine infection or specific toxic effects such as fetal alcohol syndrome (West and Blake 2005). There are early data to show that diet and toxins may have a small but significant effect on the genetic integrity of the rapidly dividing hemo-poietic stem cells, which may be an initiating event for the later development of leukemia or cancer (Sharpe and Franco 1996; Alexander et al. 2001; Thompson et al. 2001). Many hematological abnormalities are associated with placental failure, which, via intrauterine growth restriction (IUGR), can be the final common pathway through which maternal illness or complications during pregnancy affect the fetus. Other abnormalities may arise from complications at the time of delivery such as hemorrhage, or due to acquired factors such as infection or placement of central venous catheters.